On July 8th the long-awaited (really long awaited, as it’s now around six years since the new network was first proposed) new network gets rolled out on the isthmus. This will be the biggest rollout yet, and follows previous network changes in the south, the west and the east. The North Shore is scheduled for September 30th. The New Network will roll out on Sunday 8 July, with many buses arriving more frequently every day of the week, with better access to popular destinations. A new Link service will also be added to the network, the Tāmaki Link, which will provide a frequent bus service between the eastern bays and Britomart. There will also be a new bus service between St Lukes, Kingsland, Ponsonby and Wynyard Quarter, every 15-20 minutes, 7am to late in the evening, 7 days a week, connecting to nightlife, entertainment and dining hubs. Auckland Transport’s Network Development Manager, Anthony Cross says, “We are creating more options for people to travel where they want, when they want. By introducing more frequent, seven-day a week services on major routes it makes the network much simpler to understand. Ultimately, the aim is for passengers to be able to turn up and go without a timetable on all main roads. Brochures will be delivered to households and public information events will be held throughout June. Hindi and Mandarin speaking ambassadors will also be available to assist at these events. The New Network is a simpler, more connected bus network which launched in south Auckland in October 2016, the west in June 2017 and the east in December 2017. The North Shore, Hibiscus Coast and Warkworth are planned to follow later in the year. Let’s start with the improvements. Two new frequent cross town services, one (the 66) from Pt Chevalier to Sylvia Park and the other (the 68) from New Lynn to Onehunga. This will provide much better options for people travelling across the isthmus, especially when combined with the great value cross-town fares now available with zone-based fares. A much simpler network generally than what we have now. A new frequent service between St Lukes and Wynyard Quarter via Ponsonby Road. Reliably frequent services on the main arterial bus corridors – no more 20 minute frequencies on Sundays for Mt Eden Road buses. The biggest disappointment (outside the city centre, which we will get to shortly) is that the 650 bus, which travels between Pt Chevalier and Glen Innes along the Balmoral Road/Greenlane crosstown corridor, is not also a frequent service. This is potentially a really really useful route, linking together a string of centres cutting right through the heart of the isthmus, as well as serving some major locations like St Lukes shopping centre, Cornwall Park, Greenlane Hospital and the Showgrounds. Looking at the map above, it’s obvious the reason why the 650 bus has not been made frequent is because the money that would have been used on this has instead been wasted on retaining the Outer Link. We have long taken issue with the Outer Link, because it provides an absolutely rubbish service. Too slow, too unreliable, stopping in the middle of nowhere in a vain attempt to stay on schedule, and did I say too slow? The Outer Link (the orange loop line in the map) duplicates much of the 650 route on its “southern part”, between Pt Chevalier and Epsom, meaning that there really would not be much lost at all by turning the Outer Link into a service that just ran along its northern part (perhaps from Mt Albert to the city via Pt Chevalier and Herne Bay) or linking it with the blue “Tamaki Link” to put a whole pile of major attractions on the same route (the Outer Link runs pretty close to the Zoo and MOTAT). This would be much more in line with the principles of the new network, which unfortunately seem to have been lost along the way in this case. I am hopeful that Auckland Transport will quickly clarify that putting so many buses on Victoria Street is only a temporary arrangement while they build the long-promised Wellesley Street bus corridor. But given their disgraceful track record on the Linear Park it’s very hard to not be hugely cynical. Overall, obviously the new network is a huge step forward for Auckland’s public transport system and the central area makes up the biggest part of this step. By in large the changes are good and will support a better quality public transport system. It’s just a shame to see the shine taken off by two big flaws. Agree with sentiments on the Outer Link. It’s mostly ineffective and wasteful. Most of it is covered by other routes which can easily traversed using routes 22, 66, 25, 27 and the Inner Link. Start and Finish? Heidi do you know what hoisptals 650 drives past? The original proposal had a route running through Wynyard Quarter > Ponsonby > Kingsland > Walters Road (by Eden Park) > Valley Road > Mount Eden village > Epsom > Remuera station. I think it was called Cross Town 5. This disappeared with the reinstatement of the Outer Link. I am pretty sure the original reinstatement of the Outer Link removed the dog leg from Mount Eden village back down to Greenlane/Balmoral. Instead it left the village via Stokes Road to Gilllies Ave or Manukau Road for a way more direct route to Newmarket. Now it looks like it’s back to its current route. Commenters on this blog often blame we Eden Valley residents for the retention of the OL, but I much preferred Cross Town 5. I am not sure who actually likes it. Crazy too that SOV congestion in Pt Chev and Mt Eden affects the Outer Link reliability. Meola Rd needs to be reallocated to just buses and active modes, but if that can’t happen, it shouldn’t be affecting the Outer Link bus passengers in Mt Eden, Newmarket, etc. Similarly, Mt Eden needs more bus priority, but if it can’t be done yet, stupid that the dog leg of the Outer Link there means passengers are affected in Pt Chev, Newmarket, etc. It was saved so that Auckland Grammar Boys can get to the beach after school without needing to transfer. AT needs to change the outer link Steve, on feedback map it said that it will be changed. I am happy to be brutally honest about the Outer Link. Reliability is rubbish and that can start from 7:15am in my experience. Create bus lanes or scrap it. Very, very happy to see the St Lukes – Bond St – Ponsonby service brought in. Grumpy that there’s no longer a bus from Grey Lynn to Onehunga. Of course that trip took the better part of an hour and hopefully the new system will enable a quicker trip via transfers; but I’ll have to wait for the new journey planner to come out to see about that. Any thoughts on the new “Tāmaki Link”? Great day for PT in Auckland (I say that because it’s the start of something much better, rather than the end goal itself). Generally the network looks really good: The additional crosstowns will benefit the wider PT network, for example helping Western line users access destinations in the central isthmus, and vice versa. In addition to the 650 and the Outer Link, I think there’s one major opportunity to improve the frequent network further, by pushing frequent service further into the south-western corner of the isthmus. I note the 24, 25, and 27 routes all branch before getting too far south. As a start, perhaps we could look to extend the 24 frequent via Maioro / Tiverton / Wolverton to New Lynn? That could be the catalyst for tidying up the 195 and 209, which won’t need to run into the city post-CRL, and the funny 107 Rosebank (one-way) loop. By truncating those services at New Lynn, we can reinvest kms into much better local service — addressing the loss of catchment associated with extending the 24 frequent. That’s just one idea; I’m sure there are others. Nonetheless this is really promising to see. Main message is once this is implemented we’ll have about 2-3 years to gether some decent patronage data before it’s time to start planning to refine the network again in time for the CRL. P.s. I hope implementation of some of these frequent routes, such as the Tamaki Link is “linked” to bus priority improvements. C’mon AT you can do it! The whole area is like this; meaning no surprises that the local schools ban cycling to school. Serious, serious reallocation of road space to other modes is required here. For example they could have ditched the 25B, had a fully frequent 25(L), and people to blockhouse could have caught the 68 and transferred to the 25. Agree. Having the two suffixed branches on a number of routes only added to confusion. This would leave out a lot of Roskill residents who use this bus – it goes May Rd then White Swan Rd. Still not sure why the Tamaki Link needs a name as opposed to a route number. Speak for yourself (illiterate), but if you ever have taken any of the buses along Tamaki Drive, you get a number of people (tourists etc) asking the drivers “does this bus stop at Mission Bay?” etc. Renaming the route should make it easier for people to identify where the bus is going and what key stops it makes. A good thing about the Link buses is that they stand out nicely and easy to remember their routes (for both good and bad reasons). Or 77 which was the route number before being enumarated to Blue Link then Tamaki Link. Mind you, words and colours are easier to pick out than numbers by people whose eyesight is failing. It looks like the new Tamaki Link isn’t a loop, which is good, but why is it called a ‘Link’ then? Great network when you see the routes that cross over each other. But it all falls apart because the bus stops don’t get put near the intersections; that’s road space given over to the private cars, and means the transfer from route to route is too far for many users, particularly in the rain. As far as I can see, the “Link” brand has been applied only to routes that are the most appealing to visitors. I assume this is a deliberate strategy? I wonder if AT have realised they need to quickly modify the timetables before they publish them, to reflect the commitment AT have made to following the recommendations in the Road Safety Business Review, namely, the new 30 km/hr and 40 km/hr speed limits, and the enforcement of any speed limit, which bus drivers were breaking before in order to catch up to their timetables. Actually, what happens with the new KPI’s if they put the timetables out without regard to these changes? From a project staging, traffic management and customer messaging perspective, wouldn’t it have made things a lot easier to have introduced this new network at the same time as making Wellesley St a dedicated bus corridor (after physically upgrading it to cope)? Obviously it’s too late for this but it would’ve meant fewer instances of disruption. If I can think of this in 5 minutes, why can’t AT? All good ideas sacrifices at the altar of Goddess Flo’, I’d imagine. That SOV traffic in the CBD is so very, very important. Probably because it’s a major mission and yet to be built turnaround at Grafton Gully end plus CRL works in the way. Oh nearly forgot to say: We now have our own NZ version of the famous US “Route 66”. So does 66 replace the proposed crosstown 7? I’m hoping they increase the frequency of the 70. Every morning we stand on Great Sth Road waiting as full busses drive past, and that’s with all the 500’s servicing this route. Will have no chance when it’s only one 70 every 5 minutes – or 3 at once and nothing for 20 minutes like they seem to bunch now. Yep, the 70 has been a disaster if you live on the EP Highway as well. I drive to the train now and hide and ride, it is far too unreliable to be any use as a transfer service. It was really good for the year we had simplified fares but still the old bus network. About time AT put some seats in the concourse at Panmure. Being forced to sit out in the bus shelter in a driving wind in mid-winter is no fun. This interchange is on high ground and acts like a wind tunnel. Seats indoors with USB charging stations would be great. In my opinion the 70 should terminate in Ellerslie and a new service from Otahuhu to city (via Ellerslie) could replace that leg. That’s a great idea – it would also add resilience to the network when there is a problem with the trains. Try getting from the city to anywhere south of Ellerslie when a train derails for example. If you could get to Otahuhu by bus then there’s a frequent bus all the way to Papakura from there. I think turning buses around in Ellerslie would be a bit of a challenge, also it wouldn’t solve the congestion issues that occur out East that appear to cause some of the bunching. It is a good idea though as it is a very logical place to bring passengers from the east to, I would go as far as extending the 72 to Ellerslie as well if we could solve the problems of listed above. @ Jessa, Alex & David – Kind of good idea but I suspect you would overload the Panmure city bound trains & have too many transferring at Ellerslie which is not overly easy to walk to. Yes do need a good train backup along there, really only the 321 & 298 do use for that now or several other transfers. Sadly I think they real issue is you have to wait for the AMETI busway to Botany to be complete. Terminating at Ellerslie isn’t very good for those from Howick who have already transferred to the 70 at Panmure to get to upper Queen st/ K road. Once the CRL is open, transferring to the train at Panmure will make this trip easier too. To be fair, it is the central new network. The North Shore new network will, hopefully, come later this year. For the Shore, the most important issue with this one is that the buses going across the CBD have to go on Wellesley Street, and not on Victoria Street. Otherwise it will be a very cumbersome transfer to lines like the 22. Given this is about the Central New Network it would have been really odd to have any significant discussion of the North Shore. The North Shore NN rolls out in September, which is mentioned in this post. Leads me to think you didn’t actually read it but decided it was time for a rant anyway. WTF? The new network is all about making more efficient use of existing resources, how are your rates affected? Can I just give a big shoutout to Anthony Cross, who has been in charge of driving this New Network throughout Auckland for many years. He’s about to leave Auckland Transport. All that fulsome yield in the bus ridership statistics is in no small part due to Anthony planning and engaging with the public and pushing pushing pushing internally within AT. Anthony you are a champion public servant and Auckland has permanently turned the ridership corner in no small part due to your years of work. Well that can’t be true; according to miffy (or whatever he’s calling himself today) all public servants are useless. Yeah he’s leaving well that’s good news to hear! While the new network looks great, it really is just the old network with some really stupid bits removed, some cross town routes added, and some frequencies improved. I could have come up with that map myself in one week, yet it took the AT boffins 6 years. Disappointing that the most of the services stop being frequent after they branch near Mt Albert Road (e.g. the 25B and 25L). I would have though at least some of those could have been frequent for the whole route. It didn’t take the AT boffins six years, they had it sorted five and a half years ago. What took time was consultation, town hall meetings, political meddling, contracting, recontracting and reconsultation. Exactly. It’s so easy when you’re sitting in your armchair at home. Changing bus services is hard work, not to be attempted lightly. I’d really like to see some really amazing signage for the new network. Every bus stop should have a huge colourful permanent sign out front listing the frequent routes and where they go, eg: ‘Route 68: Frequent to Onehunga. Also paint a solid line in the middle of the road/bus lane the same colour as the route colour with the route number every so often. Actually what would really transform the whole bus network and Aucklands PT network is to have 24×7 bus lanes on all frequent routes painted the colour of the route. I think this would have a bigger affect than any multi billion dollar project currently proposed. In most cases the only cost would be some paint and signs (and the countless moaning from people who think public road space somehow belongs to them). This kind of thing needs to come from the top – the AT board need to make it a policy that all frequent routes will be 24×7 bus lanes within 5 years. No exceptions, no consultations, tough luck. Thank you Jimbo, At the least the parking should be removed from all routes where it affects the ability to keep to timetable. And some printed timetables at every stop, please. Ideally they would just need to be one line long – every 5 mins all day! Yes, but there are stops on the 18 route that don’t say what frequency you should expect at what time, for example, so it’s not very useful for people visiting the area and unaccustomed to the route. Agree with the comments. Also thanks to our area stealing the old 007 crosstown 66 sort of route it will be great for me getting to either train lines 7 day’s a week ;). That 650 looks pretty lame as stated by Matt. I wonder if they could redirect it down Gt Sth Rd a bit and turn around out back of greenlane train station and make it frequent. Shorter more reliable. Getting across the motorway interchange is very changeable. Then turn the 321 into a proper hospital bus via ladies mile and greenlane east instead. My idea would slow the 321 a bit with the dog leg getting across through Ellerslie but could have some advantages, the 321 would be pretty slow anyway via the Greenlane hospital grounds. The 650 could be shortened to loop in Adam St if a little turn around area was formed using a small bit of the car yard or BP car wash area there given that street looks like a quite little place you wouldn’t want frequent buses going down there and turning all day and night (though they are next a train line & motorway!). A walk track along the rail track at the end of this road as discussed before to access the train station added in as well. Actually, just reinstate the original Crosstown 4 & related routes idea for the Outer Link. You really can see how keeping the Outer Link as it is now really does stuff up everything else in the area. Crosstown 6 could have been amazing over time. Imagine if you will a proper interchange at Greenlane train station as well. I’ve only just clicked how good the Route 66 is going to be. We’ve had a few game-changers here in Pt Chev. First was the Outer Link, next the 18, and now this 66. 15-minute frequency for the whole length of Pt Chev Rd. That’s pretty awesome. Thanks, AT. actually from the bus stops there is crossings & walkway through to the mall, not too bad apart from all the poles to walk into….but the zebra has recently been changed to light controlled crossing (same as the train side) which is a downgrade. @Heidi, I see your Pt Chev etc area timetables are up today now. Is the reason they have the 101 (to University) just due to Outer Link overcrowding at peak and/or hard transfer at Pt Chev shop area for some (66 to 101) if up on the peninsular? Just realised how totally new that new frequent 20 route is from anything previously. Grant, I hadn’t spotted the question previously, sorry. At peak, the outer link is very busy, and the 101 does add capacity. But if they hadn’t had to retain the Outer Link, the 101 would have been a frequent service, which would’ve served Pt Chevalier very well. Instead of the unknown arrival times for the Outer Link (eg yesterday the one I caught was 15 minutes late and was overtaken by the next one), it would be starting at Coyle Park at a set time. We’ve found with the 66 which also starts at Coyle Park, that this is really reliable – so easy to plan around. Same thing with the Outer Link today, btw. Yesterday I was catching it from Pt Chev to town at about 4:30. Today I was catching it from Balmoral to Pt Chev at about 1:15 or 1:30. At both times, the digital displays at the bus stop were showing one bus coming really late at the same time as the next bus. A 65, without the dogleg in Mt Eden, would almost certainly have been more on time in Balmoral. (If not, what other bus priority measures are required?) And of course a bus leaving from Pt Chev would have been on time. Bring on the changes next year. I really hope the frequent users’ and new users’ needs win out over the occasional users who’ve become used to the one colourful bus they know will eventually get them where they want. Yes hope so. Funnily today I was wanting to catch either a 650 or 75 at the St. John’s / GI end. At about 9:15 going east the times were all weird like they had leap frogged each other by the time they go that far. This time they were all quite nicely spaced at that end. On paper they both come about same time sort of thing. Someone tell will they review 101 next year with 20, 650 and Outerlink service, So will 101 get changed in 2019? why is 101 not a frequent bus? I want to know what Hosptals does 321 serve, or just Greenlane Clinical Centre? Is 25 Domionon rd Bus a frequent service? maybe they could put a bridge by the Motorway interchange and make Greenlane a bus and train interchange? The Tamaki Link (Blue Link) was modified following consultation to use St Heliers Bay Rd and Apirana Ave instead of Crossfield Rd, West Tamaki Rd, Elstree Ave and Taniwha St. 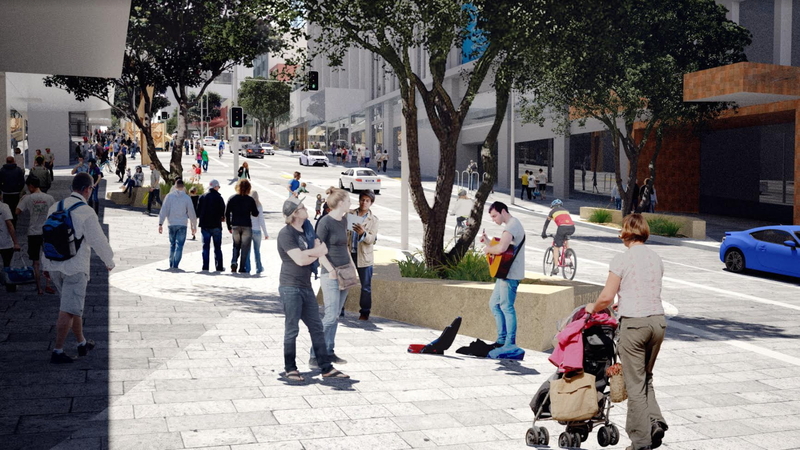 The feedback document stated the reason for the change was to accommodate requests to retain the connection between St Heliers and Newmarket to allow better connections to route 75 on Apirana Ave for travelling to Newmarket. Under the final version, Glendowie and Glen Innes miss out on an all-day frequent bus service. In addition, the new 762 takes a massive dog leg to get to Glen Innes. I think the Tamaki Link should travel via Glendowie and then the final part of the 762 route to allow frequent service from Glendowie to Glen Innes and also cover eastern Glen Innes. To retain the connection between St Heliers and Newmarket, the rerouted 762 would travel via St Heliers Bay road, Ashby Ave and Line Rd. It is worth noting that on St Heliers Bay Road between Long Drive and Riddell Road there is only one bus stop next to Long Drive. Moving the bus stop to the other side of the intersection would effectively keep the status quo. That is a lost opportunity, and a pity. How much do you think the bus network should work to feed into the train? Umm, doesn’t Glen Innes have TWO Frequent services – the 75 via Remuera and the Tamaki Link? Yes, two frequent services end in Glen Innes. With a small route change the Tamaki Link would have been much more useful in linking Glendowie and eastern parts of Glen Innes to the Train Station and town centre. No one will catch the Tamaki Link all the way from Downtown to the Glen Innes town centre and it is likely to be almost empty after the Riddell Road intersection. Not sure I agree you would want to take a very frequent bus service on a dog leg. What looks so wrong about the map in that area is that the frequent buses should go out to the eastern edge of the land, and cross or meet there. There are several different routes that could be chosen, but the way it is at the moment, there’s a whole lot of suburbia east of the Tamaki Link that doesn’t have frequent services. That is not going to help with mode-shift. It’s pretty low density out there, there is a big park and a number of sprawling mansions. I think the decision to make this route more appealing to those who are likely to use it by no meandering is the correct one. I live in one of those not so “sprawling” mansions in Glendowie and use the bus regularly. After 8 July (if the suggested timetable becomes reality) the nearest bus route (the Tamaki Link) after 7pm Monday to Saturday and all day on Sunday will be over 3 kms away. Hardly an improvement and will mean me using my car more than I do now. I agree that the Tamaki Link should be routed through Glendowie once it leaves St. Heliers. What about the other three bus routes in the area? They don’t stop at 7pm, I think you are misunderstanding the minimum daytime headway. NickR – there are two services which I will have access to – the 775 and 783. According to the timetables published last year, the 775 is Monday to Friday peak hours only and the 783 is hourly in each direction Monday to Saturday with the last service at 7pm. I don’t see what I am misunderstanding.We’ll see what the timetables due to be published in early June say. Hopefully, there will have been a rethink by AT. Ok I follow now. The 775 is clearly a peak only service, but will have to see the new timetable before passing judgement on the 783. Running six days a week and stopping at 7pm is very unusual I don’t think there are any other routes that do that. But what about the 744? That is clearly the ‘standard’ bus route for the area, and is Connector class so should run seven days and have relativley good frequency into the late evening. One person does not justify a frequent service. I agree if these routes cease at 7pm and don’t run on Sundays then that needs to be rectified but that doesn’t require the rerouting of a frequent service onto the back streets. Andy, make sure you come back and update us, please, once you know what the timetables end up being. Glendowie and Glen Innes deserve better than a 3km distance to the nearest bus service evenings and Sundays. 766 – now 783 did appear to be a 1 hourly but 7 day service but nothing after 7pm. Yup timetable is up for this area: 783 (Eastern Bays Loops) ended up hourly & nothing after 7pm. Is 7 days though. 744 is 1/2 hrly but extra service 1hr weekdays at 22:50. Tamaki Link has great span ~5:30am to ~midnight. Jezza, there must be a terrible mistake. 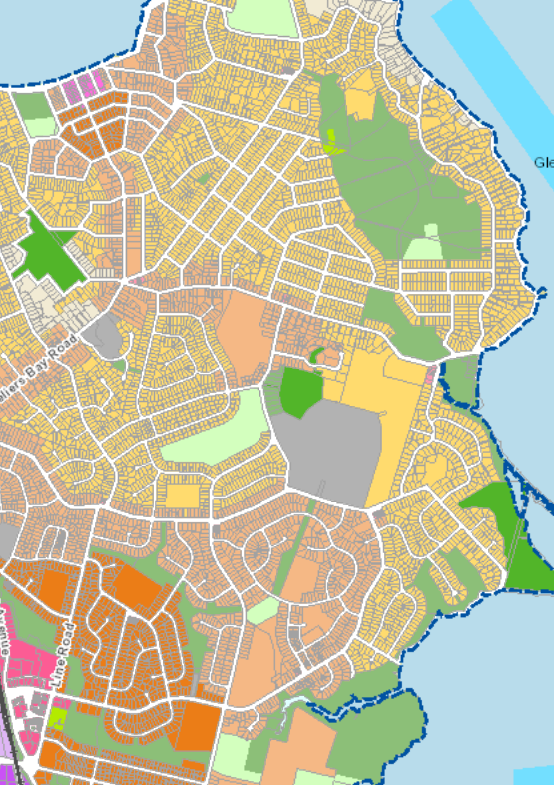 The AUP has forgotten to put intensity into the Glendowie area: https://i.imgur.com/C19Hoon.png See all that yellowish beige low-density! No wonder Glendowie isn’t getting a frequent bus service. Can’t blame AT for that! I don’t know what it replaced. I’m biased for the route currently because it is a 5 minute walk vs a 15 minute walk to the nearest stop but I agree that is doesn’t make sense to miss out a significant chunk of Glendowie and Glen Innes. If I read the consulation document right, they “planned” to increase the 762 to a frequent service as soon as possible. I suppose the demand is big enough for those in Orakei that refuse to transfer at a station. How many layers of irony were you meaning there? Did it extend to the linear park being mainly paved? To pushchairs being excluded from buses? To the damage that heavy axle loads cause? Does anyone really expect the 650 to run with any degree of consistency and reliabilty? Most afternoons it would be an endurance event rather than any useful PT. I guess the answer to that might be found by looking at the 007 reliability figures, if someone can get them. It’s not too different a route. I know many people who use the 007 regularly, and while I’ve noticed it’s sometimes running late, I’ve had other users tell me it’s pretty good. Having said that, I think AT needs to put money into ‘spare’ buses or even minibuses to quickly move to fill a gap in a frequent service. I just visited Greenlane Hospital this morning and can only comment on how bad it is for public transport. Served by just two infrequent buses the 321 (which only runs weekdays) and the 650 (which doesn’t stop in the hospital grounds). All complemented by a horrendously busy route outside known as Green Lane West. Heidi do u have photos of 650, What bus do you use to Greenlane hosipital heidi, Who knows why they kept the Outerlink? I’m able-bodied, Alan, so I can catch the 650 to Greenlane Hospital. No, I don’t have any pictures. Why does not 650 enter Greenlane Clinic,who knows why can they do it to the 321 Hospitals bus? I caught 650 to MOTAT on Saturday on Greenlane West,the good part about it is it connects MOTAT and the zoo, who thinks 650 is good? Heidi do you have photos of 650 bus?take photos of it so I know what it looks like. Yes it’s very unreliable. You never know if the roads there will be congested or free flowing at any time of the day. Often when there’s stuff going on at the Showgrounds it gets clogged because of all the people coming in from South Auckland. 650 should be a frequent routes from 7 days a week 10 mins because there is stuff going on at Showgrounds and that makes more people get out of their cars. 650 should be changed into a frequent service 65. The 650 looks like it is renumbered from the Crosstown 6 in earlier iterations and that won’t even travel at night after 7pm weekdays or weekends?! Grant is 650 being renumbered to 65， What about if they had a Interchange at Greenlane for 650 to connect to train， with that it would be easier for people to connect to train，Ibeacuse of the motorway juction， tried 650 to dominon rd a month ago and seems OK. Yes, connection between the bus and the train at Greenlane is very poor. Heidi can you get off on Greenlane West near Great South Rd to catch 650 and walk to the train station? Is 650 frequent at peak times? Someone tell me, Would Outerlink he changed next year? Disappointing to see the 295 route (currently 299) going to be an hourly frequency. Gillies Ave is congested to the brink due to the motorway onramp and parents driving their kids to school. AT should have made route 295 a frequent route (10 minutes all day), painted bus lanes down Gillies (yes they fit!) to encourage people to get out of their cars. I think this is a good part of town to get radical about school traffic. It also has the frequent 30 + Outer Link not far away + the 321 hospital bus on it. The new 295 won’t be collecting so much further south I would imagine like the current 299 would as it comes across from Ellerslie. What bus is 299 currently replaced by? Tell me Grant! …and that it was called cross country back then! I recall it as a child – I think it was Route 19. At night there will be nothing covering Green Lane West or East Rd as both the 321 & 650 won’t run at night & the 231 is only Mon-Friday! That’s a major flaw, there are currently four 007 services along there after 7 pm. It’ll affect my family member, big time, adding 60% to the time he’ll have to spend to get home from his job, and forcing him sometimes to take routes that’ll cost more, too. Given the short hours involved in the job and the low pay, it’ll make it untenable, actually. What other major arterials on the isthmus will have no evening service, AT? Yes but hopefully the final actual timetables may be different to the older proposed frequency & hours of operations table I have. How do you know those won’t run at night, the timetables haven’t been released and there is nothing to suggest they’ll not run evening services. Using the older new network frequency and hours pdf that came out after consultation has these with no night service at all. Yes I can imagine this is out of date, wish they had provided an updated one with matching numbers. It looks like panama road is losing a direct link with it’s nearest shopping centre, Sylvia park with 323. And will only be a 30 min frequency. Currently several (confusing) routes serve that low income area but most connect with Sylvia park. Yes I noticed that slight change since last map was out but should be 20 min at peak at least. Current system of 515 is horribly inconsistent in timetable though. Makes a case for improving a walking link from Carbine Rd to Sylvia Park as has been posted before on this blog. What bus is the 515 called now? Was there 757 on Panama rd in Otahuhu? Who knows what bus it is replaced by because I might need to catch it!! What bus 532 now called? I Need a timetable of the new services of it? Any idea why the Dominion Rd bus still has to go via View Rd? This really slows it down. Assume there’ll still be some flyover Dominion Rd buses? It would appear the flyover and express services are being discontinued. Both the 25B and 25L route maps do not show the flyover nor express route, and there is no ‘peak only’ service mentioned on dominion rd. The ‘changes post consultation’ document does not mention any changes on Dom Rd, so that would imply the express is still reinstated, yet the current route maps do not show it. Clear as mud, I guess we will have to wait for the timetables next month to see what services they are planning. It looks like there are some peak period express services: 252 and 253. They seem to be express versions of the 25B/L but with odd names. Still no timetables up for Dom Rd on the timetables page, how did you get those links? Also on the hours of operation and frequency table, it refers to other express services as ‘non-stop’. But the 252/253 are no refered to as non-stop. I don’t expect the 252/253 will be much slower than the old express. They take the same route, only i suspect they will pick up passengers on Dom Rd, whereas the old express did not pickup north of Mt Albert Rd. However, given the limited passing opportunities, and the frequency of a bus every couple of minutes, how much of the expresses 10 minute time saving was skipping stops? Didn’t the express just get stuck behind an all stops service? Probably most of the saving was the more direct route, which the 252/523 will follow. Because in 1964 the trolley bus wires were diverted down View Road to build the Dominion Road flyover. Noticed the Dominion Rd timetable is finally up. Yes simplified down peak “flyover” services 252 & 253 via Ian McKinnon and down Queen St (ie future light rail route from Mt Roskill) with all stops it seems. Better span though for these and the normal services eg 7 services by 6:36am vrs only 3 on the old timetable M-F. While it is only fair that people beyond the Mt Roskill shopping centre get to catch the new version of the express, it is already noticeable that those people are having to stand up. Also, what the planners have forgotten is that because the exits/entries on to the southwestern motorway were so poorly designed and create traffic issues on Dominion Rd through to Mt Roskill, beyond Mt Roskill Dominion Road is relatively empty beyond Mt Roskill right until the Valley Road intersection. If ever there was a case for disruption this is it. If only there there were Uber buses to Mt Roskill! So, am I right in thinking that people choosing to drive to town from the Mt Roskill area are hopping onto the SW motorway, then around through SH16, and that the ramps to the SW are creating congestion in Mt Roskill on Dominion Rd? How much is this holding up the buses along there, Deborah, for the commuters who are taking the more direct route to town? No this is a purely localised problem. Because the exit and entrances to the motorway are so poorly joined to Dominion Road with insufficient lanes, there are traffic jams in this area, yet as soon as you reach the Mt Roskill shops, Dominion Rd is virtually empty heading toward town. What many locals have been doing is driving against the traffic – getting on the motorway at Dominion Road and heading for the tunnels, joining the northwestern motorway and coming off at Newton Rd. Did the SW motorway really need a whole lot more land associated with it, then, to accommodate the lanes leading to it? I’m wondering what that would look like. I can’t see any way to do so without ripping sweeping curves from Denbigh Ave, through blocks of housing. Do you think cutting back the fronts of the houses on Dominion Rd would achieve it? Great to see the local bus service to Meadowbank Station. I hope it gets well supported. Tim is this bus hourly to Meadowbank station? Jimbo’s ideas on 24 hour bus lanes, even if only in the case of those bus routes that cannot maintain their timetables. There needs to be an increase in bus shelters particularly at points where people are changing form one node to another such as Takanini should be priority. Park and rides and streets surrounding them need to have parking charges s that 15% of spaces are available. Grant do you think the Grammar Boys should know how a new network works if Auckland Transport changes the Outerlink route next year? Agree with a lot of this but not the comments on the 650. That bus is basically exactly the same as the current 007, except that it terminates at Glen Innes instead of St Heliers. Patronage along most of the route would in no way justify it becoming a frequent service. And reliability of the 007 (and therefore the 650) is absolutely horrendous, particularly at peak times, due to the length of the route. I think they’ve got the 650 about right as it is. Except the 650 won’t run at night like the 007 does. was crosstown 6 now 650? Yes, that’s what we’re hoping for. It needs the Outer Link to be swapped for a set of other routes such as the 65. What month will the review the 650 and outerlink next year. 007 used to go into Greenlane Hospital, but Patrick they should put 650 in the Greenlane Hospital grounds because lots of old people catch it and they should Keep 650 in the Greenlane Hospital grounds, Why can’t the 650 go in the hospital grounds? a/ the hospital has changed its layout to provide a direct entry to the main reception at a building right on Greenlane Rd. b/ AT has changed its road layout to provide safe access for wheelchair users and patients to and from the buses, including wider footpaths, bus stops and pedestrian crossing in close proximity to the main entrance. But there would have to be an agreement from both parties that this would be achieved quickly – say, within 2 years. Failing that, if the city doesn’t consider it enough of an issue to change the road layout – ie drivers’ rights to wide roads are considered more important than patients’ rights to comfortable access to the hospital – then the hospital needs to accept it’s part of a callous, car-dependent city, accept its contribution to that state (look at the layout of the hospital!) and pay for shuttles for its patients. The 650 – and especially the 65, if we get it – is part of the network for the transport system and must not be compromised just because AT insist on Greenlane Rd being a traffic sewer, and the hospital taking no responsibility for its layout. I see the Outlink, 20, & 650 routes are all subject to review in 2019 of the crosstown services in the Mt Eden area and Balmoral Rd corridors. The 321 doesn’t have any plans to up the frequency (apart from interpeak M-F 20 min in 2028) which I think is wrong (but space at peak times in downtown & can imagine may be preventing this). I think it also should run weekends. Ideally Greenlane Station needs something done so it can interface with this & improvements to walking to Ascot, but this could be covered by a new frequent 65 & surely need bus priority across Greenlane East & West Rd’s. Heidi will 321 bus be reviewed in 2019 with 650 and Outerlink someone tell me, won’t The 30 on Manukau Rd be reivewed next year with 650 and outerlink on baromal rd and St Luke’s, Will 30 Manukau Rd bus be reviewed next year? Heidi Does 650 connect Ascot hospital, why do the drivers don’t go into ascot hospital, what bus operator is 650? I think it needs to be a frequent route 650 to 65 because it connects important locations like MOTAT, St Luke’s, Greenlane Showgrounds, Greenlane Hospital and Glen lnnes, think this 650 bus operator needs to be changed？because you said the drivers do not bother getting into Ascot Hospital beacuse they can get away with it. I think Greenlane train stations needs a bus and train park and ride in it because there’s the motorway junction on Greenlane East and you cannot cross it, agree that. Heidi On 650 from great north rd MOTAT I wanted to go on it to Greenlane to catch 70 to Pakuranga, 650 Driver has problems, We signaled the driver to stop but he did not stop for us,unbelieve, So we caught 110 from Westgate on the western network along great north rd to CBD and caught 70 there,650 bus operator very much Heidi I think they need a kick. 650 didn’t stop for me when my dad signaled it. Patrick does AT need the change 650 to 65? Do you Think? Patrick is 650 15 mins at peak, why does it connect MOTAT and Zoo? hmmm could be interesting to see. The 30 on Manukau Rd is frequent. I suspect the 295 won’t collect so much from down south/east that will stay onboard until Gillies Ave as it predecessor and it does run at 15 mins in peak. ahhh One Tree Hill other side of da hill….that 390 was pretty infrequent & 31X on the motorway. You have the 298 at 1/2 hrly normally or 20min peak which connects to the Ellerslie Train, much more consistent probably better option…depends where you are going I guess? Post CRL much better if going to mid-town of course. There is three frequent routes surrounding the suburb & a train line, if you can get to any of these you should be sweet. Wow you get a feeder bus every fifteen minutes to Royal Oak? Lucky! My local feeder bus is hourly at all times. That Oranga area does seem to be a wide swathe without 15-minute services. There are a few other PT shadows around like this too. Some are because the intensity is low and so the solution is to allow intensification. I don’t think Oranga is bad for NIMBY regulations though. Some are because the street pattern is poor for bus routes due to car-dependent planning. Oranga’s street pattern doesn’t support a good grid bus network, but that’s due to its geography rather than 70’s era planning. I hope you manage to get it to work for you, Liz. I sold my car and committed to the bus when my area was still suffering from extremely poor bus connectivity, and have watched the network here improve to reasonable, and finally now to very good. It must be awful seeing it go backwards. The 15 min peak is interesting, it goes towards the city in morning peak & also towards the Ellerslie Train station. Other way around in afternoon peak. Hadn’t noticed this, but makes sense even though slightly unusual having the double direction like that, obviously to feed to the in theory frequent train service or the city direction directly. Does it work to transfer to the train instead, so you then get 15 min peak both ways when it’s peak times, where are you heading to? That retirement home is 187 Campbell Rd? This has the 298 right outside which has a lot better 7 day coverage including 30 min service on weekday nights compared to the current 390 only hourly. Sunday’s the 390 has only 2 or 3 services. Some more timetables up today. Pt Chev. All as discussed already – Outer Link screwing up the 650 and related routes. Remuera Rd – looks pretty good & heaps better simplified around Stonefields area with useful weekend/night services now with it going up Lunn Ave too. Around Grand Dr, some users would have to walk a bit/wait more perhaps than previously in peak times anyway. Notice the frequent services 75 & Tamaki Link leave form the train station side of Glen Innes, prob good idea with the road crossing there. Mt Eden is also up, pretty predictable. 3/4 min freq at the peak of the peak from Three Kings. Also noticed just today the 68 crosstown frequent one has been altered to have a little trip on the motorway at the Onehunga end from Queenstown Rd, should be interesting to see how that goes. That cross town change around for that area west of Onehunga seems really good, going from basically two 1/2 hrly routes that didn’t usually go late or early enough to three routes with two of those been frequent. They’ve made an error in the Mt Eden timetable. On page 6 Britomart outbound mon – fri services between 16:50 and 20:00 are listed twice (in the columns on both the left and right hand sides) with no services listed after 20:00! I know they’ve made some cuts to evening services recently but this is one they probably wouldn’t cut so obviously an error in the timetable lol. Great thanks, yes they often have these repeat type errors, I let them know of one the other day. The 68 change to run ong tbe motorwsy was due to o jection from the Hillsborough Community who hadnt been consulted witb and have fit for purpose and safety concerns running a high frequency service up a narrow local street and adjacent to the local primary school. Are there any other high frequency bus routes running along local streets with around 3000 vevhiles a day? Yes most of the southern, eastern and western frequent lines run through local streets, buses do that to serve the people that live there. “Not consulted with, fit for purpose, safety concerns” to be blunt that sounds like the same old dog whistle nimby whinging from people who think buses are icky. Was there 635 bus on grand dr? Someone tell me what bus is 635 replaced by if I want to catch it, Is it one bus or two buses now? What time does 66 start? Someone tell me! Grant do you know what bus is the old 007 route from Pt cheliaver shops To St Heilers currently replaced by, Someone please tell me what bus is it currently replaced by, I need to know! Dominion Rd & new link timetable up now. Also hard copies available I see. Includes the new blue “TamakiLink” bus, fancy. Metro style timetable. I think the Link buses could have a larger span than they do, especially at the morning end. Weirdly enough, they had enough land when they built it – but sold the unused bits off. Even now if they bought back one section ( which now has three houses on it) and trimmed three other front yards they could achieve the desired effect for extra lanes. This is the area the trams will also eventually need some land if they end up joining that motorway out to the airport. It’s definitely a cost of motorway infrastructure that can’t be ignored, isn’t it? I’ve just been mapping the vegetation lost to the SH16 widening for the Waterview Connection. All the work we’re doing (at volunteer level) to revegetate areas pales in comparison to the trees that were taken for that. So at Dominion Rd, three more houses, plus three more front yards. It all contributes to the urban heat effect, to the road runoff, to the air pollution, to the wasted energy, and to the severance a motorway causes. Let alone the induced traffic of letting even more people into a slow-moving carpark so they can crawl onto a motorway, and the further dependence on cars it engenders. If Dominion Rd didn’t even have ramps to the motorway, but had the Light Rail put in instead, back when, I guess the area would be well served now. Instead the induced traffic from WC will keep climbing steeply, as it does in the first few years, and Dominion Rd will be harder to convert to LR. Full speed to them. Interestingly, today I was offered a petition by former 267X commuters, which I signed because my journey has increased by 20 minutes per trip, which means I need to leave for work by 7.30am every day. What the planners forgot was that in their effort to be “fair” by making the former express buses stop at every stop on Dominion Road was that every other bus (and many more of them) also stop at all the bus stops so we have dodgem buses. And those poor folk from further down the road get to stand all the way in. I was told in the reply from a person with only one name. “Centaine” to my email of objection to Auckland Transport that the public had been consulted back in 2015 for this new network. Considering the announcement of the light rail occurred last November, I think AT was mad to change the Dominion Road buses without taking this into account. It should have delayed. This public service is NOT a service at all if it can’t get people to work in a timely fashion. I really, badly, want an Uber bus that runs to Mt Roskill from Lynfield and White Swan Road and probably also from Hillsborough. Then we can catch buses of varying sorts, some express, some not, to the city until light rail arrives. What’s the advantage of an Uber bus compared to a public bus? Why wouldn’t bus lanes on Dominion Rd help the commute time? The biggest holdup is the car congestion, isn’t it? Apart from asphalting more land (added road capacity = added traffic vkt) do you have any ideas how to deal with that? surprising that doing pickups on dom rd from roskill shops adds 20 mins to the journey. What do you mean about adding bus lanes to dom rd? Dom rd has had them for years. And if the busses that take ian mckinnon are so much more popular (or are the regular services also standing only during peak hour?) then perhaps there should be more of them. First of all I meant the proposal for a cycle lane – not a bus lane, which is obviously already there – sorry my indignation was overriding my typing.Putting in a cycle lane where there are major problems with buses is absurd and will make the traffic much worse. I want an Uber bus because it’s disruptive – it forces the existing operators to up their game. What the far end of Dominion Road and Lynfield and the area around White Swan Road need are smaller buses that get us in a timely fashion to a hub – such as the Mt Roskill shopping centre where we could take these new trams once they arrive or perhaps a choice of buses that take the slow route or the a three-stop- express to the edge of the city (which should also have Uber-like buses running through and around the edge of the CBD).I just feel too little imagination has been used on this. The reason the extra time is added btw to bus journeys because the new “express” stops at every stop along with all the other buses whose frequency has increased – in other words, they are getting in the way of each other. Also because the traffic before Mt Roskill is much worse than the traffic from Mt Roskill to Ian McKinnon Driver the former express buses got that part if the journey down to seven to 10 minutes because they didn’t have to stop. Yesterday I took one of the buses that does the slow route through Mt Eden and people were standing up through to the university stop, which I was surprised by in all fairness. Certainly sounds like they need more capacity in the buses (ie more buses, more double deckers) and they do need to think through the fact that the buses are getting in the way of each other; all of which completely supports the need for light rail, which is the logical next step when the bus capacity starts reaching its limit. like this. Not meaning to be rude, but smaller buses do not help the situation of bus corridor constraints being exceeded; they would be a backward step. Express buses, on the other hand, should probably be revisited. The heart of the problem is that far too much of the trips taken in our city are done in the most space-inefficient mode – private car. What would be absurd is continuing to allow private cars but not making safe space for bikes. Cycling is more space-efficient and far, far, more sustainable. hmm interesting if that stays slower like that, I can see could be reality of the buses not going around the others or just waiting behind the ones in front without doing pickups creating this effect. What happened in the past when they caught up to ones in front? Could be just mid-year intakes of universities creating a minor “march madness” and people trying out the new network rather than the new style of route. Light rail will be better so you can catch a train to the airport.